Support the Show. Become a Patron! Jeremy Dunn is a rancher, horse trainer, knife builder, reata braider, and has quite a few more skills developed from a life on the ranch. And, he really enjoys backcountry camping and would like to teach more people how to access the wilderness with their horses. Many of you know I competed as a rookie in the Vaquero Heritage Trainers Challenge with a horse named Scratch. One of the judges and organizers of that event was Jeremy Dunn. Over the course of the competition, we became friends with Jeremy, his wife Brandie and their two children Sage and Steele. 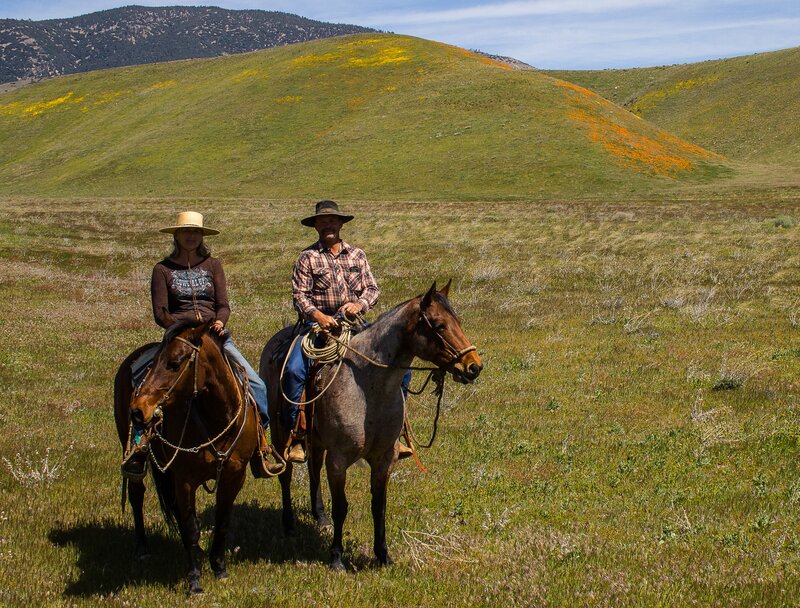 The Dunns live on a remote ranch, the Broken Arrow, in Rosamond bordered on three sides by the mighty Tejon Ranch. 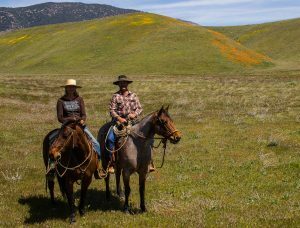 They raise cattle, chickens, a milk cow, have a garden and live the ranch life. Jeremy trains outside horses and Brandie offers clinics on homemade cheese making. I learned a lot from Jeremy about horsemanship during the Trainers Challenge and even more afterward. He impressed upon me the fact that horses need a job. His clinics are designed to measure the ability of horse and rider and improve from there. We talk about ranching, horses, and knife making. Jeremy Dunn and I have teamed up to host a clinic this May. It is a morning of instruction and an afternoon of trail riding. We want people to learn then immediately put what they learn into practice. There is a “Join Our Email” list at the top of this page. Signup. Each week I’ll send you something useful you can use to build a better relationship with your horse. Thanks! We have well over 100 episodes up now and you can find them all for free on iTunes, with our Android App in the Amazon store, and now Stitcher, or wherever podcasts are distributed. Get the Stitcher app and tell us how it works. We are on Google Play too! You can also find every episode and more about the show at whoapodcast.com. Please take a moment and join our email list. Get in on the conversation with Facebook and Twitter – just look for WhoaPodcast. We are off on another horse adventure. Yes, Ranae and I are giving the Extreme Cowboy Race a shot. I’m riding Scratch and Ranae is using my mare, Jessie. We’re giving Ranae’s horse, Dusty a break from this horse adventure. He’s getting up there in years and arthritis seems to have befriended him. Anyway, we enjoyed the Trail Trial we did last year. Both of us like negotiating obstacles. The time and speed of this event certainly make it more challenging. Every race starts with a free ride. That means you come into the arena and do a hot lap once around before you hit your first obstacle. Personally, not my part of the competition. I’m not crazy about teaching my horse that every time we enter an arena, he gets to take off at a gallop. I have a picture of barrel horses in my head. I’ll be keeping an eye on my horse to see if it’s turning him into a crackhead. But, hey, it’s a horse adventure. There are bound to be some challenges or it would not be an adventure, right? The venue is great. Shades of Gold Ranch is set in the Leona Valley of Southern California. It gets a bit windy, but the venue has a wonderful arena, a round pen, and nice little warm-up area. There are also some trails nearby. We are going up tomorrow for a clinic with Bill Cameron and we may check those trails out. Thanks for all your support. It’s how we get to have another great horse adventure! Bill Cameron has been competing and showing horses all his life. As a youngster, he planned to go to the Olympics until he came down with mononucleosis. He wanted to be a jockey and rode two horses to wins until he grew. In 2009, he entered the Equine Affaire Extreme Cowboy Race in Pomona. He won that competition on I’ll Cowboy Up. From there, Bill Cameron has excelled in Extreme Cowboy Racing. 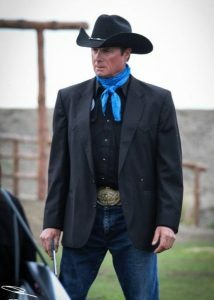 In 2012, he was inducted into the Extreme Cowboy Association (EXCA) Hall of Fame. Today, Bill Cameron is chairman of the Extreme Cowboy Association Advisory Board. He is a Level 5 (the highest) EXCA competition judge and an EXCA course designer. As part of our 2017 goal, Ranae and I have chosen to participate in the three EXCA races being hosted by Shades of Gold Ranch in Leona Valley, California. We went to Bill Cameron Ranch to learn more about strategy and training. Welcome to the Whoa Podcast about Horses and Horsemanship. My name is John Harrer. I began the podcast in 2012 because I wanted to learn more about horses and horsemanship. Talking with great horseman and women about their lives with horses and the history of horsemanship is my passion. We have well over 100 episodes up now and you can find them all for free on iTunes, with our Android App in the Amazon store, and now Stitcher, or wherever podcasts are distributed. Get the Stitcher app and let us know how it works. We are on Google Play too! You can also find every episode and more about the show at whoapodcast.com. Please take a moment and join our email list. Get in on the conversation with Facebook and Twitter – just look for WhoaPodcast. Working cows in open country is so much fun. 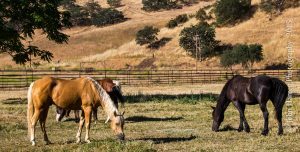 The Bar SZ Ranch was once the home of the famed Sire, Doc Bar. It is now an event ranch where people go for family reunions, weddings, and corporate retreats. We traveled there to spend a weekend with our horse friends and ride the ranch. This was one of the more fun videos I’ve produced. After telling Bar SZ Ranch manager, Tim Borland, I wanted to see how Scratch did working cows, he rounded up his Kabota and we took off. With my wife, Ranae, sitting in the co-pilot seat we first went to the south side of the ranch. Scratch did well having the little tractor driving right along side of him. And, Ranae did a wonderful job of getting footage and she was bounced around by the open trails. We found a small group that needed to be moved and circled wide. “Jerry” the bull was lounging in the spring sun. He was a bit reluctant to move, but Scratch did well. 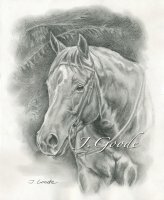 He is a confident horse and is not afraid of much once he is given the chance to assess the situation. Going over open country with the squirrel holes, uneven footing, and fallen branches can put stress on some horses. Not Scratch. We go all the cows up and moving and then it is just a matter of not rushing them. A calf tried to duck away and we had to go back for it. Sometimes you have to dip and dodge through bushes and brambles, but most of the time working cows is all about just keeping them moving forward. There were a couple of streams to cross. When a horse is focused on a job he rarely worries about things like water crossings. I think Scratch rather liked the whole experience of working cows. Scratch needs to work cows, so we headed to the sorting pen to try our hand. Trepidation is a good word to describe how I was feeling as we entered. There were horses and trailers everywhere. At this point in Scratch’s training, he was still spooking at objects and people he saw moving about. We still had the problem with going in and out of gates. Those pinch points had Scratch bolting to get through. The Sorting Pen had its own problems with all the cows and another gate to squeeze them through. Our partner in the sorting pen asked me to go into the herd on both runs. We were happy to do it. It gave us something to focus on. Videotaping the event is a great way to see where you are making mistakes. It also shows the holes in your horse’s training. From this video, I could see that my reins would get a bit long and I was micro managing Scratch. Scratch was not moving quick enough, and, when asked to stop, he wasn’t stopping quick enough. All-in-all it was a good effort for our first time in the sorting pen and I was real happy with the way Scratch handle the situation. Click To Amazon and Support Us! Learn to build a better relationship with your horse today!